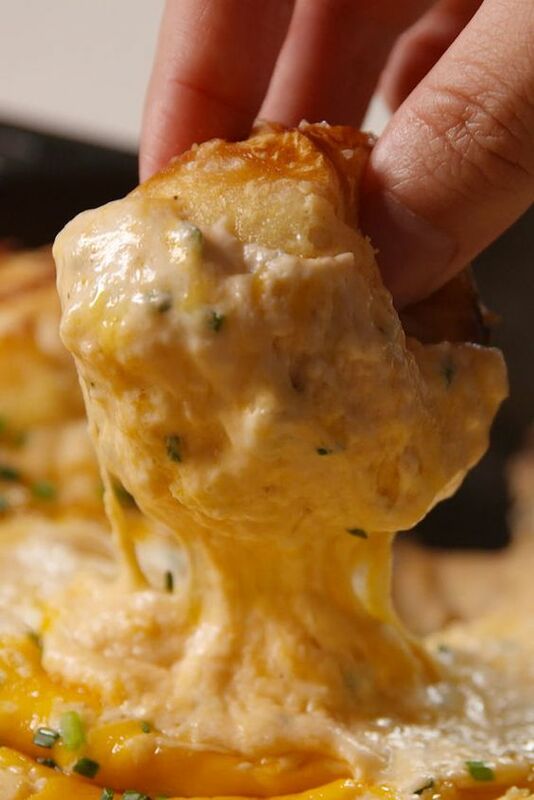 This cheesy snack is the best thing to ever happen to your skillet. Make Beer Cheese Dip: In a large bowl, combine cheddar, mozzarella, cream cheese, Dijon, chives, garlic powder, and beer and season with salt and pepper. Make Pretzels: In a small saucepan, bring 2 cups water and baking soda to a boil. Reduce to a simmer. Cut each biscuit in half and roll into a ball, then slice an X across the top. Drop into simmering water with baking soda and let cook 1 minute, then remove with a slotted spoon and transfer to a cast-iron skillet, forming a ring along the inside edge. Brush biscuits with egg wash and sprinkle with coarse salt. Transfer cheese dip to the center of the skillet and smooth top. Sprinkle with more cheddar. Bake until biscuits are golden and dip is warmed through and bubbly, 33 to 35 minutes. Garnish with chives and serve. 0 Response to "Pretzel Ring Beer Cheese Dip"